This article explains how fire rated glass blends design and safety by providing reliable 24/7 protection without the need for triggers like sprinklers do. Fortunately, building codes and fire prevention programs have reduced the number and consequences of fire over the last 30 years. Unfortunately, the United States and Canada still suffer fire deaths at a rate two to three times more than many European nations. The debate about what to do next to improve fire safety often poses a false choice between either active fire sprinkler systems or passive fire resistant materials used throughout a building in structural and accessory components. Research shows that the safest choice is to use both combining active and passive fire protection. What lost in this debate is the dual role that fire rated glass plays by offering passive fire protection in the event of a fire, while providing tangible, daily benefits in day-lighting interior spaces, increased security, improved energy efficiency and aesthetic appeal. TriData, a division of System Planning Corporation, evaluated data in the National Fire Incident Reporting System (NFIRS), which collects data from over 15,000 fire departments in 50 states. The focus was on fire containment (or fire spread) in both residential and non-residential buildings during 2003. TriData analysis turns the active-versus-passive fire protection debate upside down. TriData found that a combination of building construction, design, containment, fire load and fire department response resulted in limiting fire spread to the room of fire origin in just over 50% of all fires. The study also found that the level of passive containment in educational facilities was an impressive 87%. Sprinkler systems, when present and operating, supplemented built-in protection bringing containment to the room of origin close to 100%. Richard Licht of the Alliance for Fire and Smoke Containment and Control writes that over the past 30 years, the three national model building codes have called for increased use of sprinklers while rolling back requirements for fire-resistant components.” Licht also notes that sprinkler systems can and do fail because of human error, neglect and mechanical malfunction. Occupants in a building not equipped with the protection of fire resistant construction are subject to substantially increased danger when a sprinkler failure occurs. 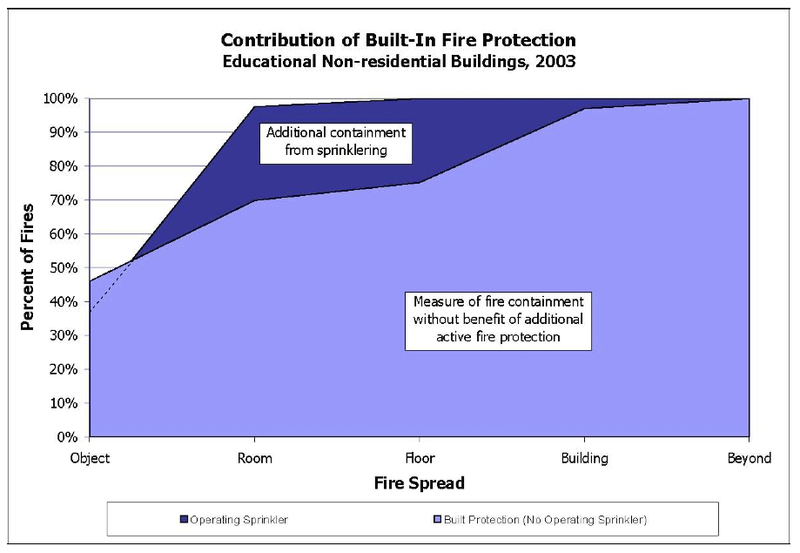 In 2010, the National Fire Protection Association (NFPA), an enthusiastic sprinkler system advocate, published a report on U.S. Experience with Sprinklers and Other Automatic Fire Extinguishing Equipment. NFPA research found that when sprinklers are present in the fire area, they operate in 93% of all reported structure fires. That means that in seven out of every 100 fires, the sprinklers fail. According to the NFPA, â€œwhen sprinklers fail to operate, the reason most often given (53% of failures) was shutoff of the system before the fire began, as may occur in the course of routine inspection maintenance. Other leading reasons were inappropriate system for the type of fire (20%), lack of maintenance (15%) and manual intervention that defeated the system (9%). Unlike sprinklers which are used only in the event of a fire, built-in fire protection created by fire rated glazing and framing provides not only maintenance-free fire protection 24/7/365, but also tangible benefits realized every day. 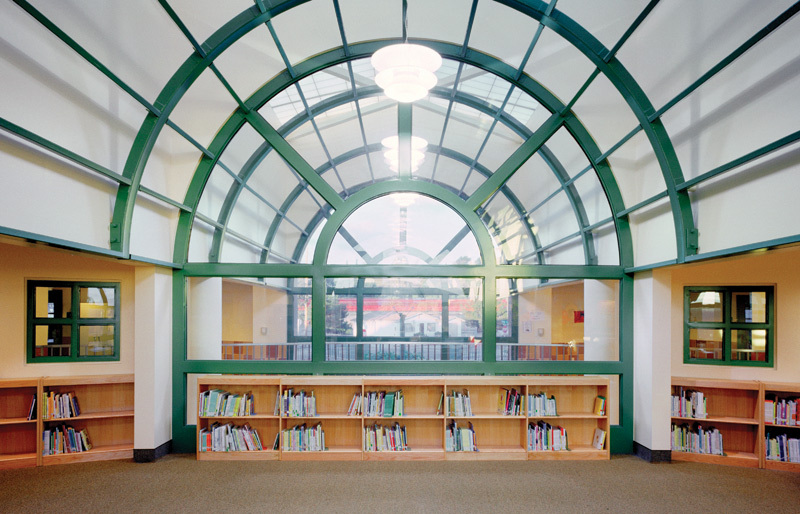 Fire rated glazing in the library at Sunset Elementary in San Ysidro CA pulls in daylight. Daylighting and Shared Lighting. Fire rated glazing can be used to make interior walls literally transparent allowing daylight to extend deeper into a building. Studies have shown that increased natural light increases student test scores and school morale, and helps save on lighting and energy costs. Fire rated glazing can also be used to share artificial lighting between spaces, decreasing lighting loads. Security. Fire rated glazing and framing in fire doors, exit enclosures, stairwells and paths of egress provide not only safe passage for occupants leaving a burning building, but also light and security to these previously dark, unfriendly places every day of the year. Aesthetics. Whether it’s new construction, renovation or historic restoration, designers are finding new and exciting ways to incorporate fire rated glazing and framing to create attractive, open designs. Innovation in fire rated glazing products means there can be a seamless transition between non-fire-rated and fire-rated areas, stairways, walls and corridors. According to a U.S. Fire Administration paper entitled School Fires, there are about 14,700 non-adult school fires annually that require a fire department response resulting in about $85 million in yearly losses and about 100 injuries. Research reveals that built-in fire protection successfully confines fire spread to the room of fire origin in 87% of educational properties. When sprinklers are present and operating, they can boost containment to nearly 100%. The cost-benefit of built-in fire protection offered by fire rated glass and framing increases many times over when the daily benefits provided by the transparency and design opportunities of glass are added in.